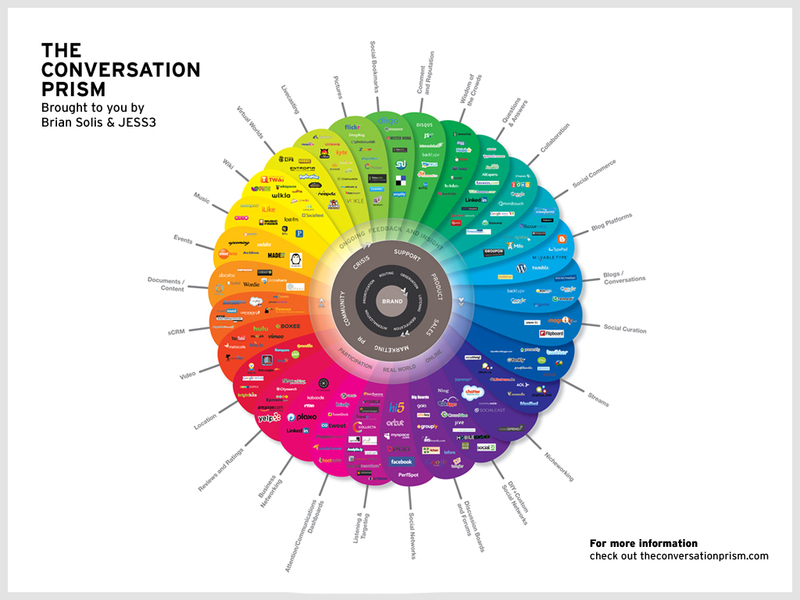 The Conversation Prism by Brian Solis and Jesse Thomas was one of the earliest models for helping to visualize the conversations that define the social web. Created originally in August of 2008, it has been updated several times as social media networks and trends have changed. The prism chart is a bit hard to see on a web page, so let’s break it down into digestible parts. 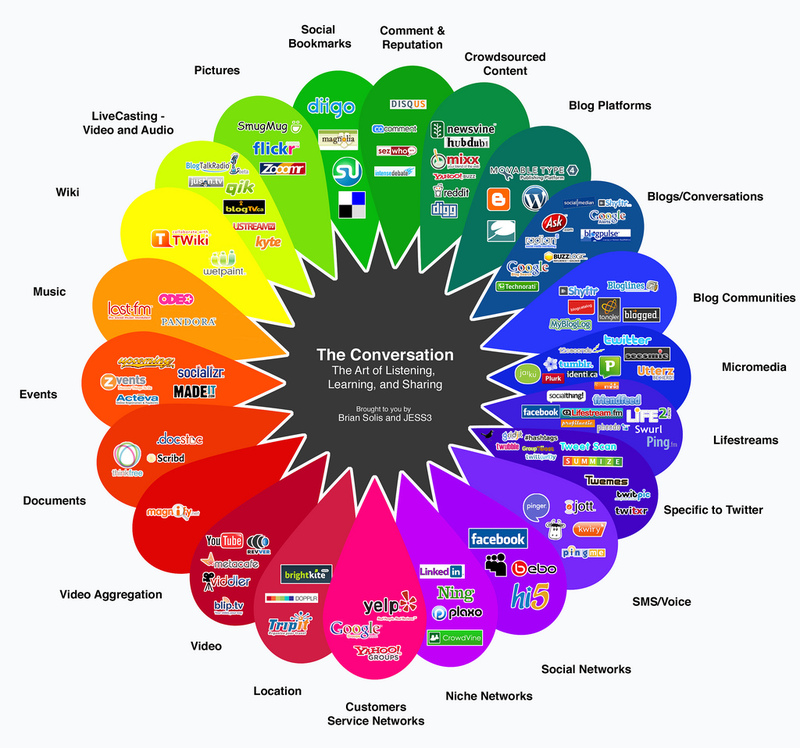 The original version one and two of the Conversation Prism spelled out strategies for business communication and the social web. It bears highlighting as part of our conversation on marketing within the social web. Version 3, shown at the top, removes the center strategies, focusing totally on listening. Many businesses don’t “get” what listening really means when it comes to the social web. The Brand is the core of the circular chart representing the end goal: marketing the brand. From this, all things branch out as the goal must be served by the actions within the social web. Wrapped around the inner Brand circle is a ring, called a halo, listing: Observation, Listening, Identification, Internalization, Prioritization, and Routing. These are the definitions of observing, listening, or participating in social media. The next halo represents the “intersection of all public facing departments,” which is the business departments or titles to create a social media Customer Relationship Management (CRM) strategy. They include Customer or Product Support, Product and Sales, Marketing/PR, Community, Corporate Communications, Crisis, and Support. Halo three is described as the completion of the conversational workflow powered by “continual rotation of listening, responding, and learning online and in the real world.” It is represented by ongoing feedback and insight, participation, online and real world relationships and communication. The outer part of the circle highlights the specific social media services sorted by subject matter and interest such as Questions and Answers found through Quora and LinkedIn, and Wikis with Wikipedia, TWiki, Wika, and other wiki-based sites and services. This chart and others are available through The Conversation Prism Store.